Tours of Israel: Travel with a Group or Travel Solo? Often, when you get ready to book an international trip, you have to ask yourself, do you want to try and manage the trip solo or do you want to book a group tour? There are pros and cons to both types of travel, and you will get a wholly different experience. Sometimes the choice simply boils down to your personal preference. But before you decide how you want to travel in Israel, let us help you figure out what type of traveler you are, and what the best travel approach would be for you. There is something to be said for traveling solo or planning your family trip on your own. 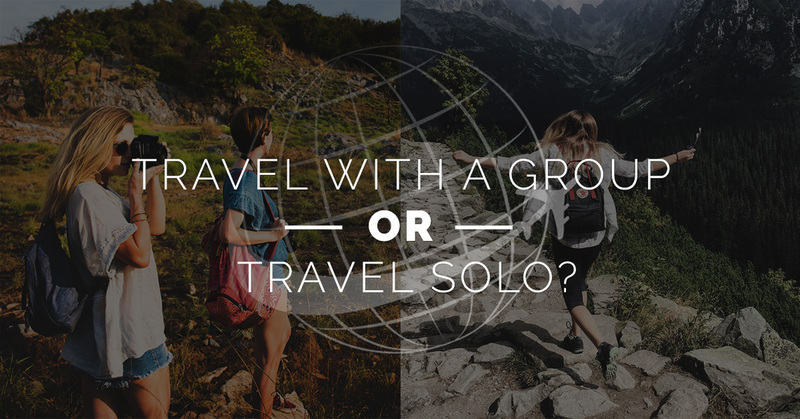 However, more often than not, you’ll find that individuals who opt to travel solo are younger, college-aged individuals, or very experienced travelers. In order to plan and execute an international trip on your own, you need to be savvy with all the online travel tools and confident in your people skills. Traveling solo doesn’t mean you just pack a bag and hop on a plane. It should mean that you have a well planned trip ahead of you, you just simply intend to execute it without the help of a travel agent, tour guide, or other individuals. It can mean that it’s just you traveling to an exotic location or you and your family. If you’re younger and single, it can be a very enriching opportunity to discover yourself and what you are capable of, but you should be sure to expect some challenges along the way. If you’re an experienced traveler, this also may be the best way to schedule a trip exactly the way you want it, especially if you’re interested in sites and experiences off the beaten path. Keep in mind, however, that there are many options that are more inclusive and versatile than simply planning a solo trip. Tour guides and travel agents can be of benefit in order to book airfare or help you get to know the city you’re visiting. Group tours are excellent international travel options for many, many reasons. They make travel much easier, especially for those who are not experienced in international travel. In fact, even the most experienced traveler will opt for a group guided tour every once in awhile for a relaxing vacation that helps you get to know just about any city. Consider the following reasons you may want to opt for a group tour of Israel. Whenever you travel, even if it’s just to another state, there is always some risk involved. However, when you travel as a group with a knowledgeable tour guide, you help improve your safety. There truly is safety in numbers when you travel that can help protect your from pickpockets and other concerns. When you opt for a group tour, you’re opting to have someone else plan your trip for you. You don’t have to worry about watching for the cheapest airfare, figuring out how to get from one city to another, or when museums will be open. This is the job of the travel agency and group tour guide in order to give you the best experience possible at the best value. You get a truly no-hassle vacation to explore the Holy Land from experienced individuals in the travel industry. One argument for taking a solo trip is that you can customize your trip exactly the way you want. When you work with a tour group, you don’t get that benefit. However, there are some great groups that will allow you to customize your experience, including World Express Travel. While it is always an option to pick a pre-existing travel itinerary, you can work with a tour group that allows you the flexibility to fit in sites that you don’t want to miss. If you’ve ever traveled solo, while you can enjoy the alone time and all the people you meet along the way, it can get rather lonely. Traveling with a group gives you optimal companionship for your unique experiences. Here at World Express Travel, we provide unique, customizable tours of Israel for you to enjoy. You’ll make memories and experience a trip that will last a lifetime. Contact us today to learn more about our travel packages and the options available to you.